This flexible form allow you to itemize all the details of the repair, including body work, if required. In addition to a complete customer contact information area, codes and categories are provided for various classifications of parts, labor and supplies. the form is padded 8 1/2" x 11" with blue ink on white 20# paper. 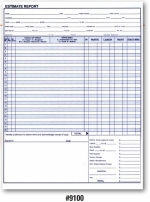 Forms are packaged 50 sheets per pad and 2 pads (100 sheets) per package.